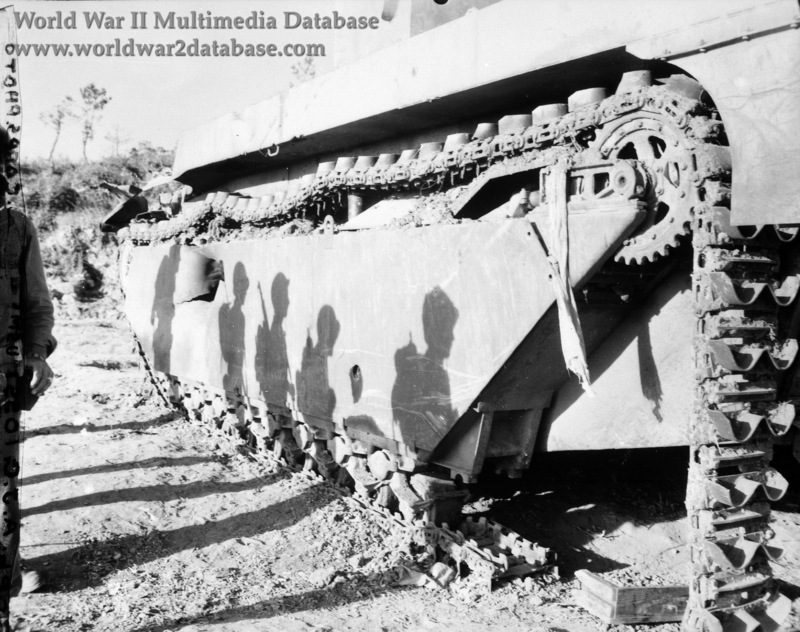 Men of the 4th Marine Regiment, 6th Marine Division, pass a destroyed LVT-4 "Alligator" Amtrac, probably the victim of a mine, at dawn on June 4, 1945, on Oroku Peninsula, the last American amphibious operation of World War II. Note the large hole in the LVT at center left of the photo. USMC General Lemuel Shepherd, commander of the 6th Marine Division, ordered the 1st and 2nd Battalions of the 4th Marines to land the Oroku Peninsula, which would cut off the last line of Japanese defense and allow the Americans to resupply by sea. Before the landing took place, a large problem for the 4th Marines was the lack of serviceable Amtracs; only 16% of the 9th Amphibious Battalion's 103 LVT-4s available at the start of the campaign were operational, and the other Amtrac units were in similiar shape. Because of the steady rain of weather and concentrated Japanese fire, the Amtracs were pressed into supply and troop carrier roles from the first day of the campaign that precluded adequate maintenance. Now, as 4th Marines headed for the landing beach in a mix of Marine and Army alligators, several broke down ferrying the 1st Battalion. Because of these delays, reinforcements from the 29th Marines were unable to arrive on the beachhead until 1000 Hours. Nevertheless, the outflanking maneuver was deemed a success, as it put the 6th Marine Division behind the Japanese.